After all the work done on Saturday, my lower back and hips protested quite a bit as Saturday worked its way to a close. I wound up taking an aspirin to sleep. It wasn't pain so much as muscle aches from muscles that don't get used all that often. And these ridiculous knees that sometimes hurt and sometimes don't. I have to be careful in taking aspirin for pain but one and I slept soundly. Of course, it helps tremendously to have the window open, a delicate breeze and a purring cat next to you. Here it is, Sunday, late morning. I lingered over peanut butter toast and yogurt and finished another magazine off the stack, which isn't that much of a stack anymore. It's rather a group. At the rate I'm reading these, it will be gone by the end of the year and I'll be down to just the magazines I read every month or quarter when they arrive. I put on a clean tee shirt and ambled out the door. Time to finish this up. 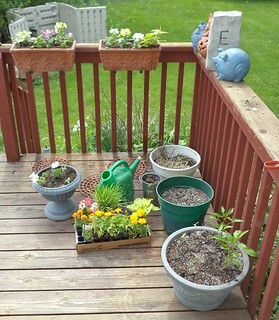 After filling the green and the white pots with marigolds, I still had zinnias, salvia, nicotania and some cosmos left to plant. Trundle out to the shed and decide that the shed really, really should be cleaned out. Well, I'll do that when I'm finally done. 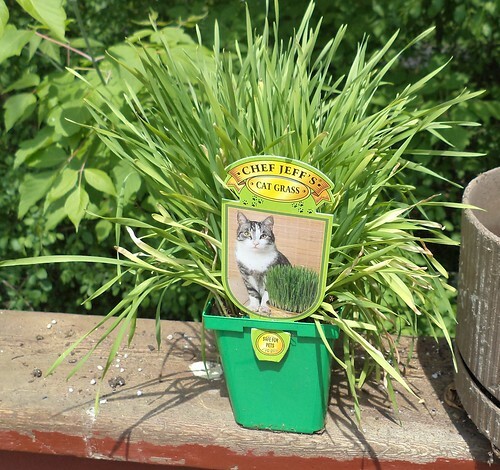 One of the things I got this year is cat grass. If you have cats that are outdoors or spend time outdoors, you know that they will run outside, roll in the yard and then eat some grass. Experts are unclear what role grass plays in a cats digestion because they don't really digest it. They vomit it back up, I've found, usually, on the rug that is the cleanest. There is a school of thought that they eat this to calm an upset stomach but even healthy cats with no known problems will eat grass. The girls are welcome to come onto the deck while I am outside. They come out for a bit but don't stay out. While I don't mind that they are skittish and prefer the inside to the outside, being outside can provide some benefits, fresh air and sunshine being the primary one. I figure with the extra chair, that will help and I thought maybe the addition of something to chew would be another incentive to be outside with me. Now, I could be creating more problems than I'd like since I could find cat grass on the cleanest rug but having grass available has been shown, anecdotally, to be a calming effect. Heaven knows, with it being the seasons of thunder and lightning, I can use some calming. We'll see. If nothing else, it makes an interesting plant amongst the pots. 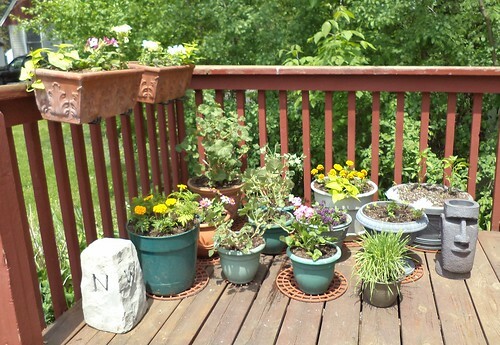 So here's the north side of the deck with everything planted. I don't necessarily like this arrangement of pots. I'm going to give it a week and the move things around a bit. With the chairs, the birdbath and the flowers, this is a very inviting space. What time are you showing up?